Greater trochanteric bursitis is a condition of the hip which results from added stress or friction between one or more of the three main hip bursa and the greater trochanter (1, 2, 3). The additional stresses or friction to the lateral region of the hip can result in inflammation of the hip bursa/bursae which are fluid filed sac(s) designed to cushion and minimize friction between hip muscle tendon/strcture(s) and bone (greater trochanter). When inflamed, the synovial lining of the bursa thickens and produces excessive fluid that causes pain and localized swelling (3). 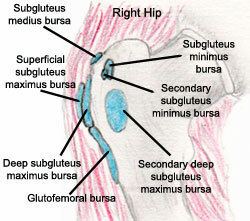 The three main bursae at the lateral region of the hip are the subgluteus maximus bursa, subgluteus medius bursa, and the subgluteus minimus bursa (3, 4). The subgluteus maximus bursa is the largest of the three bursae and is most often affected with greater trochanteric bursitis (3, 4). Individuals with trochanteric bursitis often complain of a deep, achy pain located at the lateral aspect of the hip which may also radiate down the lateral aspect of the thigh to the knee. Pain often is experienced with activity or with sleeping on the affected side. Upon palpating or touching the lateral aspect of the hip, the individual will often complain of marked tenderness at this region. There are many factors which could contribute to trochanteric bursitis. The most common are overuse, acute injury, chronic microtrauma or regional muscle dysfunction (3, 4). Overuse injuries could result from overtraining or participation in various activities such as running, skating, cycling, climbing, etc., while an acute injury could result from direct trauma to the region of the lateral hip or hip surgery (1, 3, 4). Chronic microtrauma results from small levels of strain to the lateral hip region as a result of repetitive motions, abnormal gait, altered biomechanics or abnormal posture (1, 3, 4). Regional muscle dysfunction involving tight or weak muscles could contribute to the development of trochanteric bursitis as well (4). Obese individuals along with women are also more likely to develop trochanteric bursitis (3, 4), while individuals in the fourth to sixth decades of life also have an increase risk (5). Other conditions associated with trochanteric bursitis include: chronic mechanical low back pain, degenerative arthritis or disc disease of the lower lumbar spine, degenerative joint disease of the knees, fibromyalgia, iliotibial band syndrome, inflammatory arthritis of the hips, ipsilateral or contralateral hip arthritis, leg length discrepancy, pes planus, tendonitis of external hip rotators and total hip arthroplasty (6). There are many other conditions which may present as pseudotrochanteric bursitis, therefore a thorough examination should be conducted to determine if a patient truly indeed has trochanteric bursitis (3, 4). A patient with trochanteric bursitis will present with pain/tenderness upon palpation of the lateral aspect of the hip. Swelling may manifest in this region as well. Pain may be experienced by the patient with active movement and strength testing of the involved hip for hip abduction and external rotation (3, 4). Flexibility testing of the iliotibialband and gluteus medius muscle may display decrease flexibility and a gait analysis may display a Trendelenburg gait pattern as well (3, 4). 1) Jones D & Erhard R. Diagnosis of Trochanteric Bursitis Versus Femoral Neck Stress Fracture. Physical Therapy. 1997;77(1):58-67. 2) Krupp M & Chatton M. Current Medical Diagnosis and Treatment. Lang Publications. 1978:511. 4) Williams B & Cohen S. Greater Trochanteric Pain Syndrome: A Review of Anatomy, Diagnosis and Treatment. Anesthesia & Analgesia. 2009;108(5):1662-1670. 5) Rowand M, Chambliss M, Mackler L. How Should You Treat Trochanteric Bursitis? The Journal of Family Practice. 2009;58(9):494-500. 6) Lievense A, Bierma-Zeinstra S. Prognosis of Trochanteric Pain in Primary Care. British Journal of General Practice. 2005;55:199-204.